If a hard disk partition has any error or bad sector, it probably cause unexpected data loss or other trouble. Therefore, it is necessary to check partition for errors and bad sectors and fix problem in time if you realize that there is something wrong the hard disk partition on your computer. 1. Hard drive makes strange noise when you read or write data on it. 2. It takes a long time to access a hard disk partition. 3. PC frequently shuts down or reboots when you try to open hard disk partition on your computer. 4. PC runs Scandisk to check all hard disk partitions automatically when you start your computer. 5. Windows pops up disk drive is not formatted do you want to format it now when you attempt to access a drive on your computer. Step1. Open My Computer on your computer to show all drives on your computer. Step2. Right click the partition that you want to check and select Properties. Step4. Click Automatically fix the system errors and Scan for and attempt recovery of bad sectors and then click Start button to check errors. Step1. Search This PC and open it to show all disk drives. Step2. Right click the partition you want to check and select Properties. Step4. Click Scan Drives to check the partition for errors. Whether you use Windows built-in Error-checking tool or run Command Line to check disk for errors, you may encounter the situation in which Windows cannot check disk for errors. 1. If it is a partition which does not contain the Windows operating system, you can close all programs and windows that may use the partition and then use any of methods above to scan the partition for error. Or if Windows system gives an option Force a dismount, you can select this option so that Windows will dismount the selected partition and check it for errors. 2. If it is system partition, you can click Schedule disk check so that it will scan the partition when you boot your computer next time. Pay attention: You have 10 seconds to press any key to cancel the task if you no longer want to check the partition for errors when booting your computer. Step1. 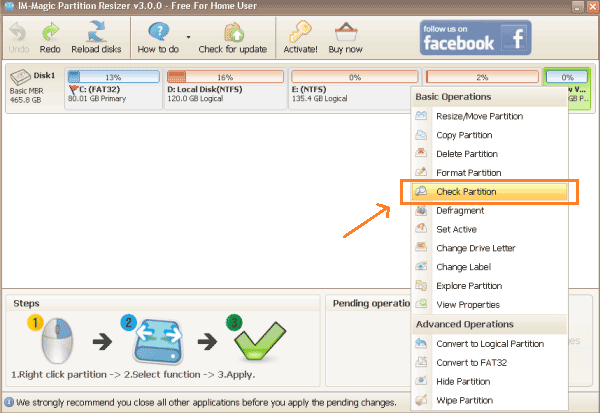 Right click the partition and select "Check Partition" option. Step2. Select the options to check the selected partition and click "OK" button.